The Best Hamburger Recipe I have ever had. Add my secret ingredient, grill it in a skillet or on a griddle (can also be grilled outside), then top it with Homemade Chili and Sauteed Mushrooms in Cream Sherry, for a juicy, tasty burger and a fine dining experience. Place meat in a bowl. Sprinkle on salt and toss lightly. Pour in milk and mix it lightly, being careful not to over mix. If food has a tendency to stick to your skillet or griddle (I use a cast iron griddle) brush on a little oil before adding your burgers. Place your beef patty on the pan or griddle until the bottom is brown and it seems to be cooked more than halfway up the sides. Brush with liquid smoke. Flip burger and brush this side with the liquid smoke. Grill until bottom side is done. Takes about 2 more minutes. 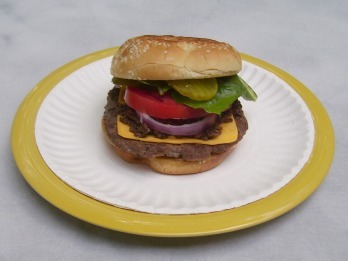 If you are making cheeseburgers add the cheese to the second side when the bottom side is about halfway done. Or, add your cheese when you stack your burger, if you prefer. Some folks like their cheese added after the burger is are taken from the pan because it has more of a cheesy taste than when it is melted. While your hamburger is grilling, butter the soft sides (inside) of your buns and toast on the griddle or in another pan. You can toast it under a broiler, but you won't get a uniform crunchy toast like you do if you toast it flat in a pan. Toast the top side of buns that the sesame seeds are on, if preferred. Now stack your burger the way you like it, adding condiments or your choice (some suggestions below) . Be sure to add my Homemade Chili and enjoy your Best Hamburger Recipe, ever. Here is an extensive (not complete) list of condiments and additions to customize your special burger. Many of these you probably already use. However, we hope this will give you some ideas to enhance your dining pleasure.